Mark Yates made his second signing of the season today when he snapped up the former West Brom striker, Justin Richards (right) - his first signing was an extension to his contract earlier in the week. Richards was released by Peterborough Utd on Monday after just one season at London Road. In that time he made just a handful of appearances, scoring once, and towards the end of the season went out on loan to Grays and Boston where he failed to score at all. 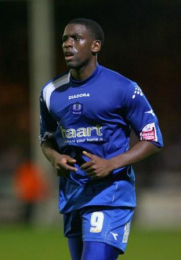 In comparison his time at Woking from 2004 to 2006 was more fruitful and he scored 36 times in 89 games. That's the kind of scoring prowess that Yates, and the fans, will be looking for from the West Bromwich born lad who can also list Bristol Rovers, Colchester and Stevenage amongst his former clubs. A starting place in the team is not guaranteed and he will need to fight for his share of games with Iyseden Christie and James Constable. At least it will mean that our existing pairing will now have some competition, something that was lacking with Andy White and Gary Hay last season and to a lesser extent with Luke Reynolds. The Harriers board must have confidence in Richards' abilities because he has been handed a two year contract along with a, presumably, decent salary.